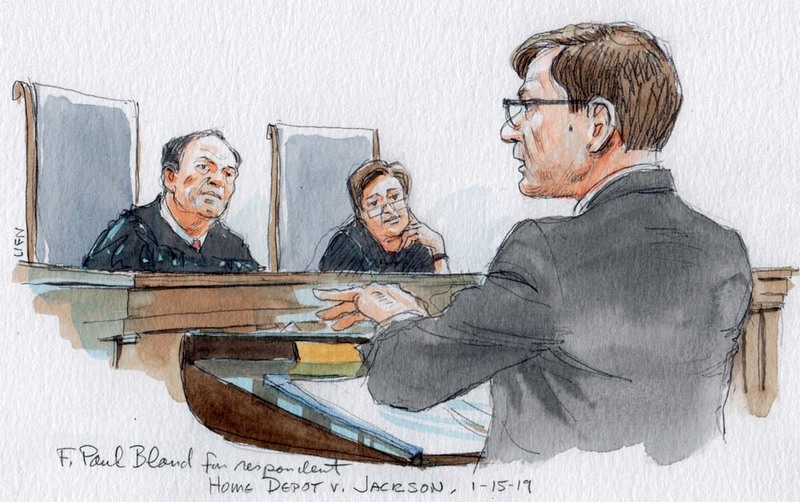 Yesterday morning’s argument in Home Depot U.S.A. v. Jackson was a notable one, as Justice Elena Kagan brought a strong view of the case to the bench and proceeded to dominate the argument. 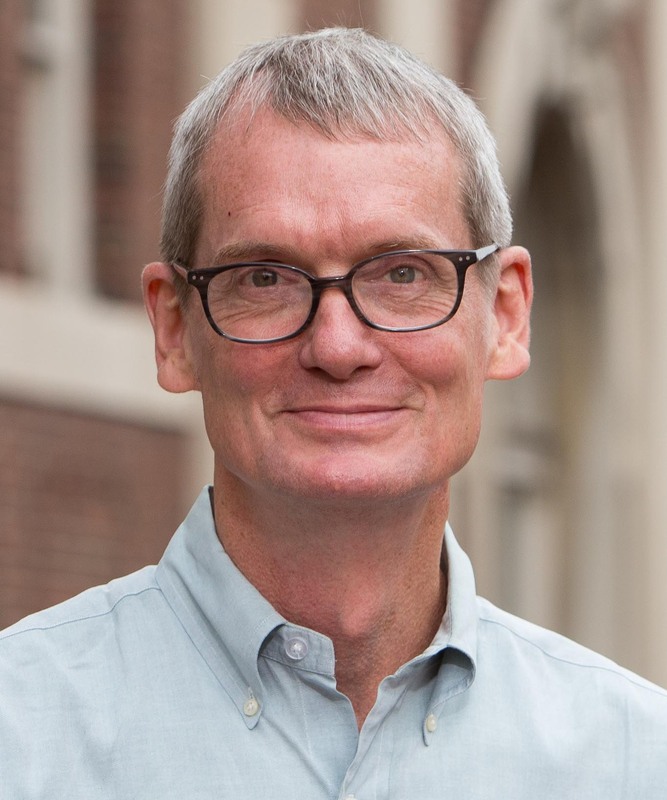 The case involves the removal of litigation from state court to federal court. Under Section 1441 (and predecessor provisions dating back to the 18th century), “the defendant or the defendants” generally has a right to remove “any civil action brought in a State court of which the [federal] district courts have original jurisdiction.” In 2005, responding to concerns that state courts have been unduly receptive to class actions, Congress adopted the Class Action Fairness Act (often called the CAFA), which included a variety of provisions designed to make it easier for class-action defendants to remove those cases to federal court. One provision, in Section 1332, granted original federal jurisdiction over most class actions seeking a recovery of more than $5 million. Another provision, in Section 1453, provided that “any defendant” can remove a “class action” as defined in Section 1332. Together, those provisions make it clear that if a plaintiff initiates a large class action in state court, any of the defendants can remove the case to federal court. Home Depot presents an odd twist on that framework. In this case, the initial litigation was between Citibank and respondent George Jackson: Citibank sued Jackson in state court to collect a debt arising out of a purchase Jackson made that was connected to Home Depot. All agree that the Citibank action could not have been brought in (or removed to) federal court. The next step, though, is what makes the case interesting: Jackson responded by asserting both defensive claims against Citibank and a class action against Home Depot, alleging a variety of consumer-protection claims. Citibank then withdrew its claim against Jackson, leaving Home Depot alone in the litigation against Jackson. Home Depot responded by filing a petition seeking to remove the matter to federal court under the CAFA. The lower courts rejected Home Depot’s petition and concluded the case should return to state court. 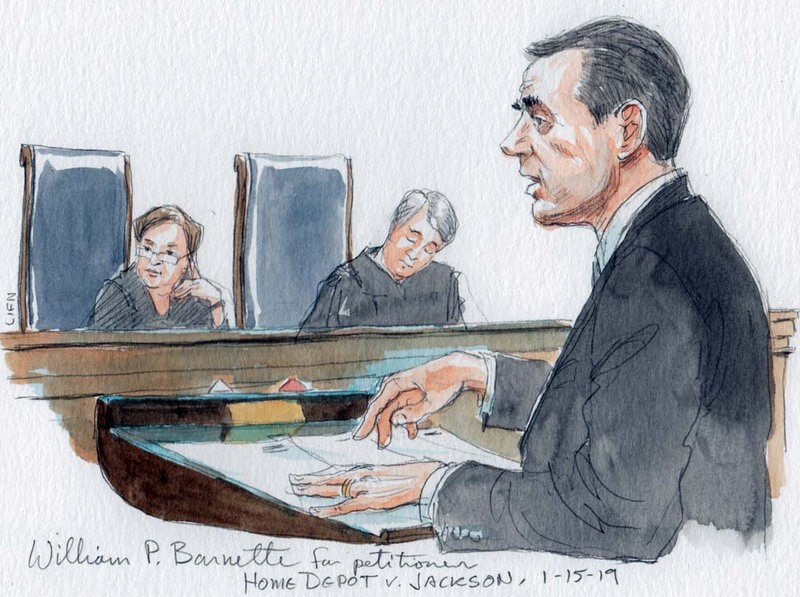 As I explained in my preview, the parties for the most part briefed the case on the question whether Home Depot qualifies as a “defendant” under Section 1441 and 1453, with Home Depot arguing that as a literal matter it plainly is a defendant and Jackson arguing that the history of Section 1441 shows that the term “defendant” refers only to the party against whom an action initially is filed. Kagan came to the bench with a somewhat different take on the matter, appearing strongly predisposed to rule against Home Depot because the initial complaint in this case (filed by Citibank) did not institute a “civil action” over which federal courts would “have original jurisdiction.” For her, the key to the case isn’t whether Home Depot is or is not a defendant, it is whether the “civil action” at issue here could have been brought in federal court – and it plainly could not have been. That view squarely collided with the presentation on behalf of Home Depot, represented by William Barnette. [Y]our claim might be under the original jurisdiction of the district courts if … that had started the lawsuit. But that didn’t start the lawsuit. The lawsuit, the civil action, was started by a claim that’s completely non-federal in nature. And you look to the original claim to decide whether the courts have original jurisdiction, don’t you? [Y]ou’re suggesting that we should look at this case as though the original claim never occurred and we should pretend that the claim started with the original defendant. But the case did not start with the original defendant. The civil action started with the original plaintiff, who brought a claim against a defendant who then brought a claim against you. [I]s there any good reason why a claim like this … should not be removable to federal court? … If a claim like this is filed originally in … state court, it can be removed, but if it comes into the state court in this strange sort of back-door way, then it has to stay in state court. You really think that that’s a possible decision Congress would make? At the end of the day, it is not at all clear from the argument how the court will resolve this one. We should find out by the end of June.